E. H. McAllister, the genial proprietor and manager of the Commercial Hotel, Baldwins leading hostelry, was born in Coxsackie, Green county, N.Y., April 3, 1857, a son of Charles E. and Harriet (Roberts) McAllister, natives of New York state. The father was born in Stuyvesant, Columbia county, December 2, 1830, and the mother in Flat Bush, Green county, January 22, 1831. The former went to sea when but eight years of age and continued to sail the brine until 1905, when he left his position, as captain of a big boat, and took up his residence in a beautiful home at Albany, N.Y., where he and his wife live at the present time. They had four children. E. H., the subject of this sketch, was the oldest. John W. died in infancy. Charles E., Jr., is secretary of the E. W. Howell Coal Company, of Albany, N.Y. He married Louise Foster, daughter of Captain H. Foster, of Albany, and had three children: Lena, Lucy and a child which died in infancy. William is a physician living at Albany. He is still unmarried. E. H. studied under private tutors and attended private schools. He studied for the bar, and was prepared to be admitted to practice when he changed his plans and took up work as a traveling salesman, which he followed with maked success for twenty-one years. In all that time he worked for but two companies, the famous Austin, Nicholas Co., of New York, and the E. C. Harley Company, of Dayton, Ohio. In pursuing the work of salesman he made hundreds of friends, and today he numbers among his acquaintances thousands of hotel and traveling men, with whom he has come in contact in various parts of the country on his numerous trips as a salesman. In 1905 he decided to settle down. Coming to Baldwin he purchased the Commercial Hotel, and has since conducted a first class traveling mens hotel, with comfortable rooms and good table, together with excellent service. Mr. McAllisters own pleasing personality has no small share in the success that he has achieved. To know him is to like him, and in every way he deserves a title, "jolly good fellow," being at the same time, however, a keen business man. He is a good citizen, a good man, a big hearted companion and thoroughly honest and upright. He is a Republican, but has never sought public office. In 1908 his friends elected him a justice of the peace, but he refused to qualify. Mr. McAllister is unmarried and attends the Episcopal Church. He belongs to the Woodmen at Baldwin, the Maccabees at Waterloo, Ia. ; the A.O.F. at Jersy City, N.J., and the I.C.M.A., of Chicago. His Masonic affiliations consist of membership in the following named convocations: Marion, Ia., Lodge No.6; St. Croix Chapter No.44, Hudson Wis., and St. Croix Commander No. 14, also of Hudson. In all of these societies he is popular and well liked. It is interesting to note that Mr. McAllister is a lineal descendant of Captain Coo, the navigator, and great-grandson of Captain Hurd, of New London, Conn., who covered his heroic name with glory during the Revolution, being one of the gallant Connecticut Minute Men. James McFetridge was born in Ireland, April 15, 1849. His father, James, married to Mary McBresnahan, moved to Pennsylvania in 1850 and worked in a lumber and sawmill for three years. He received three more years experience in the same line at St. Joseph, St. Croix County, Wis., and then bought a farm in Somerset, in the same county. This he occupied ten years until the time of his death. James, Jr., received a common school education and then took up farming. After thoroughly mastering all the details of farm life he decided to venture into the business for himself. Accordingly, in 1883, he bought a farm of 240 acres. To this he speedily added forty more, making in all 280 acres in the town of Richmond. William McFetridge is a native of London Day, Ireland, born February 17, 1845, son of James and Mary McFetridge. The father brought his wife to America in 1851, landing first in New York city and then staying in Pennsylvania, lumbering, for three years. They came to Wisconsin, May 1855. William was one of their six children. Margaret married Hiram Jacobs, a farmer and lumberman. Jane, a schoolteacher, died in 1867. Anna, a schoolteacher, lives at the present time with William, who was the fourth child. May married Alexander W. Beal, a retired farmer. James married Margaret Carroll and lives on a farm in Richmond township, Wisconsin. William received a common school education and left school to join the Union army. He served in Company G, fiftieth Wisconsin Volunteer Infantry, under Captain Clemment and Col. J. G. Clark. The company was used as a reserve in Kansas and Dakota for eighteen months and then purchased forty acres in Richmond Township and lived there nine years until 1876, when he bought 160 acres more and broke and developed the land, making all improvements. Mr. McFetridge was married, December 3, 1890, to Celia A., daughter of George and Betsy Frissell. She was one of a family of eight. John Frissell, her brother, born 1851, township of St. Joseph, was the first white child born between Hudson and Superior, Wis. The father was a justice of the peace at New Richmond for several years, and also at Cumberland, Wis., two terms. Mr. and Mrs. McFetridge have four children. In 1899 Mr. McFetridge sold 160 acres and bought forty acres near the city line of New Richmond and moved there in March of that year. Mr. McFetridge is an independent voter. He belongs to Richmond Lodge, No 216, I. O. O. F., and the family worships at the Methodist Episcopal and Baptist churches. Mr. McFetridge is a strong believer in education and does what he can to advance its interests. Robert McIlroy, son of John and Elizabeth (Kennedy) McIlroy, was born in Ireland, June 14, 1818, of Scotch parentage. He moved to Glasgow, Scotland, in 1831, serving five years apprenticeship in the provision and grocery trade from 1834 to 1839. From 1839 to 1847 he was in business, coming to America April 29, 1847. He began his manufacturing career in North Andover, Mass., in that year, and later became superintendent of the Norway Plains Company, of Rochester, N. H. He spent the year 1853 in Hyde Park, Mass., building and purchasing machines and starting the manufacture of woolen mills. Returning to Rochester, N. H., and later the Winthrop woolen mills in Maine. He continued in his business until he moved to his present location in Warren Township in the 70s conducting general farming operations and stock raising until he was too old for active work. Although now over ninety years of age, he is still secretary of the Farmers Mutual Insurance Company and writes insurance for that organization. This activity at his advanced age, while unusual, when looked at from an ordinary standpoint, is not uncommon in his family, his father having lived to be over ninety-nine and his grandfather of 100 years old. Mr. McIlroy now owns 160 acres of well improved land about one mile from the village of Roberts, and also some fine property in Duluth, Minn. He was married in 1840 to Frances Castle-Franc Burges, who died in the East, leaving two children: Mary Ann and Elizabeth. For his second wife he married Sarah Brierley, daughter of Edmond S. Brierley, of English descent. Ten children have blessed this union: John R., Edmond S., William H., Frank T., James C., Josiah N., Titus (deceased), Frances, Alice and Louise. Mr. McIlroy is a Republican in politics, a Mason and a member of the Independent Order of Odd Fellows. Although far beyond the usual span of mans existence, he is well informed and in the possession of his faculties, having an acuteness of judgment that might well be envied by many men still in the prime of life. William McNamara is a native of Stanton township, St. Croix County, Wisconsin, born July 21, 1876, son of James and Mary (Lee) McNamara, old settlers of the county, of whom a sketch appears in another part of this history. William received a primary education in the common schools, where he distinguished himself as a bright scholar. He finished his education in the Normal School at River Falls, Wis., and then engaged in the grain business for the Wisconsin Elevator Company at Stanton township, Wisconsin, for two years. Subsequently he bought grain for three years for the New Richmond Roller Mills Company. In 1900 he opened a general store, and two years later he built his present store in Stanton village, where he carries on a big business. He carries $5,000 worth of the finest stock, and his honest and upright dealings have won a large trade. In company with thomas Lee he built a warehouse in 1903 and purchased 11,000 bushels of wheat. Later the two gentlemen built an elevator, which they have since continued to operate. The store and elevator business are both prospering and growing from year to year. In 1903 Mr. McNamara was married to Anna M. Ring, daughter of Patrick Ring, a farmer of Erin Prairie, now deceased. The mother now lives with her daughter. Mr. McNamara is a Democrat in politics and attends the Catholic church. He is a member of the Modern Woodmen of America and the Catholic Order of Foresters. He is one of the widely known men of the township and is highly regarded for his affable spirit and his business ability. Thomas Maloney was a well known citizen of New Richmond, Wis. He died in August 1908, in his beautiful residence, where he moved a few years ago after retiring from active farming. He was born in Co. Mayo, Ireland, a son of John and Mary (Padden) Maloney. John Maloney came to Canada, in 1846, where he remained two years. In 1848 he went to Wheeling, W. Va., working on the Baltimore and Ohio railroad twelve years, the line being the first one laid in that section of the country. In 1860 he went to Ohio and worked on the Monticello railroad for one year. Coming to Wisconsin, he located at Whitewater and continued working on the railroads. Two years later he moved to Hudson, WIs., and after a short stay took up his residence at Erin Prairie, St. Croix County, Wis. He bought 240 acres and made general improvements, remaining until his death in 1871. Thomas Maloney received a good education in the public schools and then took up farming and lumbering with his father until the latter's death, when he took the home farm and for a number of years made wheat his principal crop. Later he took up stockbreeding and dairying. He carried on general farming business with much success and devoted a part of his time to Durham cattle. In 1861 Mr. Maloney was married to Kate Early, of County Mayo, Ireland, where her father lived and died. Her mother came to this country and died at Erin Prairie, Wis. Mr. and Mrs. Maloney were the parents of six children, all of whom are prominent in the localities in which they reside. Peter Meath is a native of Ireland, born in 1842, son of John and Mary (Coleman) Meath. The parnets came to Milwaukee county, Wisconsin, in 1850, remaining there until 1857, coming to Erin township the following year. They took up a section of land at the government price of $1.25 an acre. Together with his sons, the father broke all the land and made all improvements, erecting some fine buildings. He continued general farming until June 22, 1877, when he died. The mother died in the month of August, 1860. Peter received a good common school education in Ireland and Wisconsin, after which he took up boating on the St. Croix River for three years. Subsequently he returned home and located on 120 acres of the old homestead at Erin Prairie, Erin Township, presented to him by his father. He broke the land, made all improvements, built a house and barns and sunk a 122-foot drilled well. For several years wheat was the principal crop, but later Mr. Meath turned his attention to raising barley, oats and corn, and breeding graded Shorthorns, Berkshire and Chester White hogs and other live stock. Mr. Meath was married November 28, 1867, to Ann Phillips daughter of P. and Ann Phillips of Canada. Three children have blessed this union. John is a salesman at Minneapolis. Mary is a music teacher, now at home. She is very proficient, having pursued special courses in music at Prairie du Chien, Wis. Agnes, the youngest daughter is at home. Mr. Meath is a Democrat, and for twenty-one years has served as a member of School District No. 3. The family worships at the Catholic Church. Peter Meath was on of a family of six all of whom became respected residents of this section of the county. William is a successful farmer of Erin Township; Thomas was also a farmer in the same township being now deceased. John is an Erin Township farmer. Peter is the fourth of the family. Mary married Michael Martin, now deceased. She lives in New Richmond. Rose married and is now deceased. Thomas F. Meath is a native of this township, born December 23, 1867, son of John and Mary (Donahue) Meath, the former a native of Ireland and the latter of the United States. The father came to this country, and after living a short time in New York, moved to Erin township, where he bought 120 acres, which he broke and improved. He is still living on the old homestead, carrying on a general farming industry and raising cattle, hogs and horses. Thomas F. was educated in the school District No. 3 in Erin township. He worked on the farm with his father and did general labor in his younger days. From 1889 to 1892 he spent at Tacoma, Wash., as an agent for the Tacoma Ice Company. In 1899 he purchased a farm of 160 acres in this township, and at once started making improvements on the place. In 1900 he built a beautiful home, valued at $2,000, nicely furnished and equipped with all modern conveniences. In 1906 he erected a fine new barn, which was destroyed by fire August 13, 1908, Mr. Meath immediately erecting a finer structure, valued at $2,500. In 1907 Mr. Meath added eighty acres more, adjoining his own property. He now conducts general farming, raising vegetables, grains, hay cattle, hogs fowls and horses. For thirteen years he has been general manager of the New Richmond Roller Mill Companys branch at Cylon, Wis. He was married June 28, 1893 to Mary Walsh, daughter of Thomas and Bridget (Connelley) Walsh, natives of county Mayo, Ireland, who located in Erin in the early 50s. The mother is still living. This marriage was blessed with seven children as follows: Veronica was born June 5, 1895; Charles was born July 28, 1896; Clare, August 22, 1897; Ambrose, February 2, 1899; Leonore, October 25, 1900; Richard, January 17, 1902, and Robert, July 15, 1905. Mr. Meath is a Democrat in politics, an attendant of the Catholic church, and a member of the Cylon lodge, Ancient Order of Hibernians and New Richmond lodge, Catholic Order of Foresters. He has been school clerk of District No. 1 for two years. Mr. Meath has been very successful in all his undertakings and is generally regarded as a man of ability. He is a great believer in the public school system, and his children will be given the advantages of a good education. William Meath was born in Ireland in 1832, son of John and Mary (Coleman) Meath. He came to Muskego, Wis., with his parents and engaged in farming with his father. Later he settled in Erin Township, purchasing 160 acres of land, which he broke making all improvements. Upon this farm he has continued to live, carrying on general farming and breeding livestock. William was married in the month of February 1858, to Rose Barrett, daughter of John and Susan Barrett. This union has been blessed with eight children. 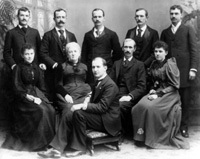 John married Mary Celty, and lives at Fargo, N. D.; Frank married Mary Cunningham, and lives in Cylon, Wis.; Thomas married Anna Ginley, and resides in Erin; Anthony married Annie Fischer; Dennis attends to the farmwork; Peter married Sadie Clark, and lives at Moorhead, Minn.; Ellen married William Grady, and resides in Erin, and Mary, the youngest married William Fitzgerald, a restaurant keeper in St. Paul, Minn. Mr. Meath enjoys the confidence of his fellow citizens. He has been town treasurer two terms and has served as a member of the school board. In politics he is a Democrat, and the family worships at the Catholic Church. D. H. Minier is a native of Pennsylvania, born in 1847, son of E. B. and Ariann Minier. The father combined the occupation of farmer with the profession of a Methodist clergyman. He came here in the early days and died in 1905. D. H. Minier came to St. Croix County in 1868 and settled in New Richmond, working in the woods, threshing and breaking land. Subsequently he started a livery barn, which he has continued for over thirty years. The business is now housed in a large brick barn on Main street, where there is a continual stock of from twenty-five to thirty horses, with fine vehicles and other equipment, which make the place the leading livery in New Richmond. Mr. Minier was married in 1880 to Emma Chambers, whose parents were old settlers, coming to this section in the early days. The father was a contractor and subsequently became mayor of La Crosse, this state. The mother was a Southern lay, a niece of General Stewart, of Confederate army fame. Her people were well to do and owned considerable land in the South. Mr. and Mrs. Minier have three children, Hugh, Emma and Thomas, all of whom are at home. Mr. Minier is a Republican in politics, but has always refused to take public office, although the matter has been suggested to him several times. For thirty years he has been a Mason, and he had the honor of representing the New Richmond lodge at Milwaukee recently. Nicholas Moelter was born in Germany September 25, 1846, son of John and Margaret Jenges Moelter. He was educated in the city and high school of Haragersper, Germany, and enlisted in the German army when twenty years of age and served through the German-Franco war. After the close of the war he engaged in farming in Germany until 1876, when he came to America, arriving in Judson, Wis., May 6, 1876, and left shortly afterwards for California, where he remained two years. He returned to Wisconsin, marrying Miss Elizabeth Knott, of Somerset, St. Croix County, Wisconsin, and they are the parents of four sons and five daughters, all living. Shortly after his marriage Mr. Moelter engaged in the restaurant business in Osceola, Polk County, Wis., which he conducted for five years, then moving to Judson, where he purchased the St. Croix Hotel property, which he owned for many years. He farmed for some time on the L Del farm, where O. H. Steindorff now resides. In 1901 he came to Troy Township and took up his residence at the home of his oldest son, J. L. Moelter, with whom he and his wife now reside. Mr. Moelter is a member of the German Catholic Church and he also belongs to the Knights of Columbus. In politics he is a Democrat, but has never been forwardly active in public affairs. JOSEPH MOORE was a hard working farmer of honest and upright habits, who owns one of the well-cultivated farms of Emerald Township; He is a quiet man, much devoted to his family, one who finds his greatest pleasures at his own fireside rather than the rush of turmoil of public and political life. He was born in this township on the old Moore homestead June 15, 1866, son of Lawrence and Katherine Moore, now deceased, natives of Ireland, who settled in Emerald in the early days and continued farming operations with considerable success. Joseph received a good common school education and then took up farming with his father and his brothers, assisting in breaking, developing and cultivating the old home place. In 1901 he took possession of the place and erected a house and barns, fixing the farm up generally. He now carries on farming on a moderate scale, raising the usual crops and breeding a fair amount of livestock. Mr. Moore was married June 14, 1892 to Mary Brown, daughter of Henry and Margaret (Shea) Brown, farmers of Warren. Her father died November 20, 1897 and her mother died November 4, 1899. Mr. and Mrs. Moore have 8 children. Henry Ervin, born April 21, 1893. Joseph born December 28, 1897. Margaret, born September 12, 1898. Celestine, born June 26, 1900. Lawrence, born June 2, 1902. John H. born May 4, 1904, and died February 4, 1905. Charles born December 14, 1905, and died November 1, 1906 and Mary born July 15, 1908. Mr. Moore is a democrat, but has never sought public office. Being the father of a large family, all of whom will be given the opportunities for acquiring a goodly store of learning. Mr. Moore is naturally interested in the public school system and is a director of the board in school district No. 1. LAWRENCE D. MOORE was born in Emerald, Wi. on April 10, 1869. Son of Lawrence and Katherine Moore (natives of Co. Carlow, Ireland), who came to America in the early 1850's. They located first at Hudson, WI., where the father worked on the river for two years. He then moved to Emerald, and took up farming. Lawrence D. received a good common school education and then took up farming on the old homestead, continuing for 20 years. Subsequently, he bought 80 acres of land in this township and broke the land, making general improvements. He later purchased 80 acres more. Upon this fine place now stands a beautiful residence built in 1898. Mr. Moore was married to Katherine Garrity also of this township, a daughter of Edward and Katherine Garrity, who came to America from Ireland. There are three Moore children. Katherine was born March 17, 1892. Lawrence was born July 3, 1986 and Liz was born February 22, 1905. Mr. Moore is a hard working man and has been most successful in all his undertakings. He is an independent voter, he belongs to the Catholic Church, and fraternizes with the Cylon Lodge, Modern Woodman of America and the Ancient Order of Hibernians. He is a director of School District No. 3 in which his services and advice are highly valued. PATRICK MOORE, an early resident of Hudson was, according to his baptismal record, born Jan 30, 1829 in Hacketstown, county Carlow, Ireland. He was the son of Lawrence and Ann (Sweeney) Moore. It appears that upon his arrival in the US he went to Hartford, CT. where he applied for citizenship in 1853. He then came to St. Croix County and purchased 41 acres in Hudson on December 15, 1855 and additional property on April 1, 1857. His brothers John, Peter, Lawrence, Christopher and Joseph Moore also settled in the Hudson area. One brother, Thomas Moore, made his home in Auburn, NY and died there in the 1870's. Another brother, Dennis Moore, and a sister, Elisa (Moore) McCabe, remained in Ireland. Patrick was married to Norah McMahon, who was also from Ireland. However her birthplace in Ireland and parents names have not been found. Patrick and Norah had the following children, Anna Jane, born August 15, 1856. Charles Edward, born May 25, 1857, Lawrence, born Feb 19, 1860, Patrick Henry, born March 1861, John L, born April 28, 1863, Joseph W., born July 9, 1865, George E., born April 29, 1868, and Mary Elizabeth born Oct 26, 1870. The family left Hudson in about 1867 and moved to Stillwater, MN. Patrick went into the grocery business, in partnership with Michael Kinsella, dealing in groceries and provisions under the name of "Moore & Kinsella". In 1876 they moved to a farm in Swift County, MN, living there until 1881 then moved to St. Paul, MN where they remained the rest of their lives. Norah Moore died on June 4, 1901 and Patrick on May 11, 1903. Both are buried at Calvary Cemetery in St. Paul. Henry M. Murdock, M. D., was born in Antwerp, N. Y., in October 1823; moved to Gunning and attended school until 15 years of age; moved to Pulaski, N. Y., is the son of Dr. Hiram Murdock, with whom he studied medicine until 19, when he went to Castleton, Vt., and attended medical lectures, and graduated in May, at the age of 21 years; left for Dexter, and practiced medicine for three years. Married during this time Miss Cornelia A. Sanford, daughter of Dr. Sanford (from a family of doctors); moved to Pulaski and went into partnership with his father, and opened a drug store: this he followed until 1854, when declining health obliged him to go West. He came to Stillwater and bought the drug store and business of Dr. Carli, where he remained until 1858; from there went to Taylors Falls and practiced medicine, and the following year, started a drug store, and sold it; in the spring of 1860, removed to Hudson, and formed a partnership with Dr. Hoyt, where he remained until the fall of 1861, when he took the position of Assistant Surgeon in the 8th Wisconsin, which he held until 1865. He suffered with typhoid fever, when in camp, for four weeks, when he joined his regiment at Haines Bluff; was at the siege of Vicksburg, and every three or four nights went into the trenches on guard duty; was the first in the streets of Vicksburg after the surrender; was in the battle of Yazoo City and Mechanicsburg, June 4, 1863. Came home on a furlough; remained until October, when he returned to Vicksburg on the 28th following; went from there to Memphis, remaining the winter at LaGrange and Salisbury. Was in the Red River expedition with Banks; went with Gen. Smith and attacked Fort Derusy, the key to the Red River, in the night, and stormed the fort, taking three or four hundred prisoners. June 18, 1864, appointed Brigade Surgeon, by order of Maj. Gen. A. J. Smith. August 4, went home on veteran furlough; remained at home until Sept. 16, when he returned to Memphis; took charge of convalescent camp until Nov. 17, 1864. Sept. 1, 1865, started for home, arriving at Madison, Wis., Sept 16; paid off and left for Taylors Falls. Married, in the winter of 1865, to Capt. Allans daughter, Sarah J. Moved to New Richmond in February, 1866, and practiced medicine for two years, when he bought out the business of Gibson, and the business kept increasing obliging him from time to time to enlarge; this he sold four years ago last fall. On account of a disease contracted on the Yazoo River, he has been in the receipt of a pension and is now retired from business, but with an eye on it all; he owns a farm of 1,000 acres. He has two childrenCornelia A., Henry A.; Estell died in 1852, at Pulaski, N. Y. In the spring of 1849, started for the West, landing at Chicago, where at the time there was only ten miles of railroad from the town; took a satchel, and on foot, went to Janesville, Watertown, Oshkosh, and, not liking the country, while in Chicago was offered about five acres of land with a shanty on it for $300, where now stands the most populous part of the city. When he started in life, had an old mare and a sulky, a box of medicine and $8 in money, and he located in Dexter. When in Taylors Falls, walked twenty-six miles on foot to visit a sick patient too poor to buy a horse.